I don't think I've ever reviewed a 4-way split before. Though a great way for multiple bands to get noticed, writing about four projects under one banner is definitely going to be an undertaking. Excuse any awkwardness! Opening with a short clip about the NWO, Connecticut-based duo Bitter Peace rip through a rather odd, yet conservative black/death metal. The riffs and beats are all semi-standard fare, based in dark tones and fleet-fingered blast beats, but it's Nathan Kite's vocal performance which really makes "Ageless Conquering Wolves" a unique experience. Layered, half-spoken clean voices give the impression of a man possessed. Pleading, slurred, grating... I'm not sure if I enjoy it or not, but such an odd vocal performance can't go unnoticed. I'm definitely intrigued as to where Bitter Peace will take their sound, but for now it seems to be "in the making." I've been following musician Alex Poole for some time now, dating back to the earlier days of his previous oddball black metal project Chaos Moon. Though Chaos Moon is now gone, Poole's latest project Esoterica rose from the ashes, releasing two digital-only EPs on their Bandcamp. Steeped in the mangled hand-mashings of Blut aus Nord's pre-"777" works, Idololatriae and Knell were a pleasant surprise and departure from the oft-melodic leanings of Chaos Moon, but "O For A Thousand Tongues To Sing" is a much more traditional track given Esoterica's experimentally-bent scope. A smattering of blistering riffs, Esoterica's trademark atonality takes a backseat to a greater focus on aggression, bringing about comparisons to, say, Black Witchery's awkward, well-read son, or early Darkthrone high on salvia divinorum. An odd, probably quick transformation to Esoterica's sound, but definitely appreciated. Krieg is a household name. I mean, let's face it, you can't discuss the impetus of the United States black metal movement without at least mentioning N. Imperial's groundbreaking work with his pet project. Following the trend of "wow, what a strange performance" found on this split, "This Time I'll Leave You To Drown" is one of Krieg's rare, more melodic moments, akin to some of the band's more recent work on The Isolationist. Trudging at a consistent, mid-paced plod, thick guitars follow a rarely changing rhythm figure, concentrating more on various melodic and harmonic themes found within the repeating "main theme." Our friends in Iron Hops cite The Cure as a possible source of influence, and, given Imperial's reputation for covering songs in that vein, I definitely can see it (especially with the distant lead which whispers its way in as the track moves on). Of course, Imperial's voice is as gravelly and gross as ever, but this time something seeps through the anger; dare I say something mournful? As always, Krieg never fails to impress. Labelhead Nathan Kite returns as a means of closing this short split with his own solo project The Many. For such a short track, "Infinite Wisdom" is some eerie material. Based in an ambient-ish sort of "doom rock," Kite's voice covers the gamut of disgusting, animalistic rasps, deep bellows, and an odd, almost whining clean voice (the latter caught me off guard). A unique, haunting song, I definitely will look further into The Many's discography. 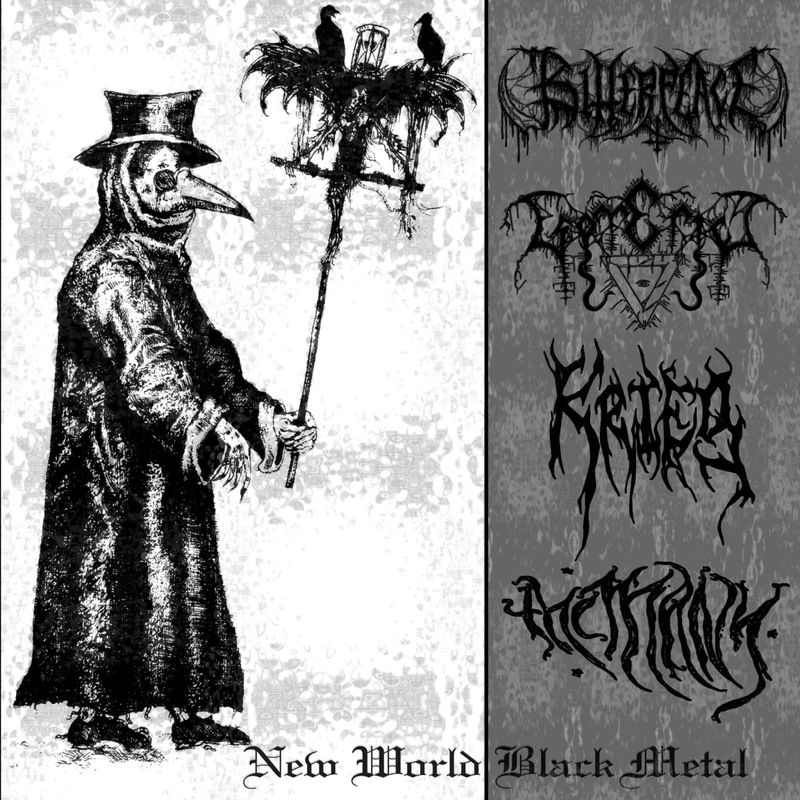 Though "New World Black Metal" once referred to "black metal of the new world," I can't help but feel this 7" re-connoted that phrase. 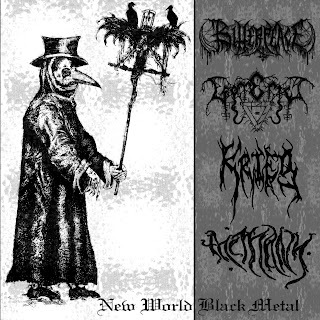 We are in a new age, a new world, and who is to say black metal can't change with that? Bands like Krieg, who have been around from the beginning, are more than enough proof that things can evolve while maintaining a sense of identity. This is a black metal split, just...different. My only complaint? Gosh, this sure is short. Can there be a New World Black Metal, Part II?